I want to understand the code that is used in libjpeg-turbo for decompressing jpg, specifically the code for inverse discrete cosine transform. * code is based directly on figure 4-8 in P&M. I guess I need to find either that Arai, Agui, and Nakajima's paper, or that Pennebaker & Mitchell book somewhere to understand that code. Other versions are "slow integer" (jidctint.c simd/jidctint-sse2.asm) and "fast integer" (jfdctfst.c simd/jidctfst-sse2.asm). I'd like to understand all of them. 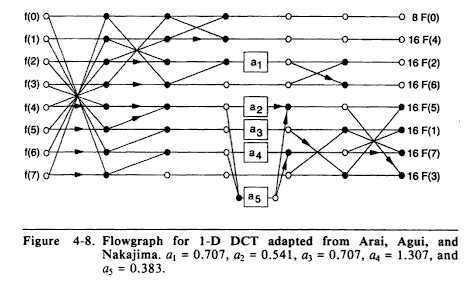 I'm less familiar with DCT, but I think it's similar to the Discrete Fourier Transform (and its inverse). You can represent a signal (such as sound) in the time domain, or spatially if you are dealing with a single two-dimensional image. The Fourier Transform or DCT I think, provides a means to represent that signal in terms of frequencies (the concept of frequency content). Frequency, by its nature, involves repetitions, so compression can take advantage of these 'redundancies.' The transform involves coefficients which are these building blocks which can be 'decompressed' back to the spatial or time domain (decompressing a JPEG). Fourier thought you could break any signal (sequence of numbers) down into a sum of sines, which some mathematicians thought was impossible. Where the DCT uses cosines (I think in this same way), DFT uses sines and cosines, or analogous complex numbers using Euler's identities. I have H. Joseph Weaver's "Applications of Discrete and Continuous Fourier Analysis" and it's on my to-do to implement a Cooley-Tukey FFT down the road. There are online calculators for some of this stuff, so if you feed in a series of numbers, you can verify the output. I've got Discrete Convolution/Faltung down so far (verified here), but this frequency stuff is very interesting. Mathworks DCT link, showing the principal functions and descriptions of the terms. I use fixed point , the code in this file decompress a file for test and can be use like library. Is a translation of a c code. Wow, r4 is very mature, seems like it has many capabilities. So the jpeg lib can leverage r4asm to generate fasm-style asm? yes, hit f5 in the editor, and this generate the source code in r4asm/ folder and compile with fasm, the code generator is not very well, I need improve this! I know the main principle of compression, I need to understand the actual algorithm used in libjpeg. Why this one is used? Why this one is fastest? What are alternatives? How those numbers (0.707106781 0.382683433 1.414213562) are computed? I can't read that, unfortunately. Looks like algorithm is slightly different. If you go from left to right, it's "DCT", compression. If you go from right to left, it's decompression. I don't understand what those black dots, white dots and arrows mean. and  mention Arai-Agui-Nakajima (AAN) algorithm, Loeffler-Ligtenberg-Moschytz (LLM), and Feig and Winograd algorithm. MPEG   uses incompatible with jpeg implementation of dct, which is fast but less accurate. mention dct that doesn't need any multiplication whatsoever, it uses binary shifts only. I guess this is incompatible with jpg? "The DCT, the frequency transformation used by JPEG, is slightly lossy because of roundoff error. JPEG XR uses a type of integer transform employing a lifting scheme. The required transform, called the Photo Core Transform (PCT), resembles a 4 × 4 DCT but is lossless (exactly invertible). In fact, it is a particular realization of a larger family of binary-friendly multiplier-less transforms called the binDCT." "This approximation is chosen to minimise the complexity of implementing the transform (multiplication by Cf requires only additions and binary shifts) whilst maintaining good compression performance." This binary dct is very intriguing. Can you use it with jpg, or maybe jpg-like format? Decompression speed is just as important for me as compression ratio. Same speed, mostly same quality. Can save electricity with proper hardware support. Hi, on the DCT side, I looked into the Matlab equations more and was able to compute and verify some results. Have to catch a train in a couple mins, so this is a bit rushed. I can elaborate points later if needed. You can start breaking the two dimensional equations down by zeroing out some components and increasing the input size incrementally. I didn't find many online 2D calculators to verify results with, but did find a 1D calculator as one of the first search engine results. each with rowCount and columnCount of 2. You then add each of the other input values, with the x,y values constant (since they are only going into this one destination slot in the result matrix. When the destination x or y is 0, the scalar value is 1/(sqrt(rowCount)) (replacing rowCount with colCount when computing the y equivalent). When the destination index is not 0, the value is similar, but 1/(sqrt(2/rowCount)). So then you just multiply these, the sum, and these two scalar values. In the case above where you rowcount and colCount are both 2, the two values would be approximately 0.707106781186547 and 0.707106781186547 at index 0,0. The inverse transform works on the matrix that was computed to retrive the original using a pretty similar method, but re-arranging when the scalars are multiplied. Gotta catch this train. r4's fasm output may have some readable asm of the dct, as mentioned earlier. Found yet another variant of dct. Unfortunately, it's behind the paywall. >with very low latency and very low complexity. >requiring only 44 additions---the lowest arithmetic cost in literature. >What’s interesting is that JPEG isn’t trying to shrink the file size with JPEG XS. In fact, quite the opposite. Whereas the JPEG standard has a compression ratio of about 10:1, JPEG XS comes out to a 6:1 ratio. I can't make sense out of this. I removed some unrelated things like quantization, and turned 2d transformation to 1d, 8 numbers on input and 8 numbers on output. I need to read those papers. Okay, I can read butterfly diagrams now. Lines are additions, lines with arrows are substractions (i guess because for substraction the direction is important, unlike for addition), boxes with a1 a2 a3 a4 a5 are multiplications by this constant number. Black and white circles don't mean anything, they probably indicate direction, doesn't matter. It looks like code comments use those weird c2 c4 c6 constants, and I know only a1 a2 a3 a4 a5. Most of those constants are just divisions, turned into multiplications, (instead of dividing by a1, they multiply by 1/a1 instead. Same result, but slightly faster). Yet this 1.082392200 constant is 1 / 0.923, and there is no such number. wait, I think I found what c2 c4 c6 mean. How would you prove that 1 / cos(45 degrees) = cos(45 degrees) / 2 ?